No business is free from getting complaints. There will be times when problems are going to pop up and both employees and customers are going to notice them. 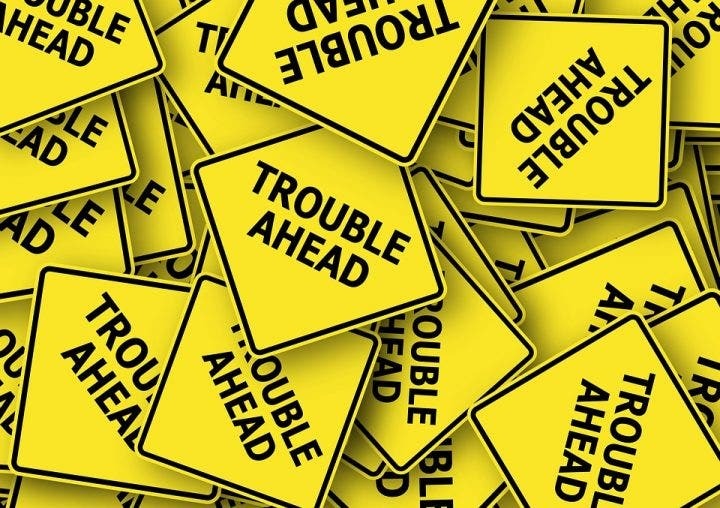 Whether it is how the customers are being treated by the employees or how the employees are being treated by management, certain problems will be unavoidable. So, as a business owner, you need to learn how to acknowledge these complaints to show people that you understand the problem. Most important of all, you need to let people know that you plan to address and resolve any issues. 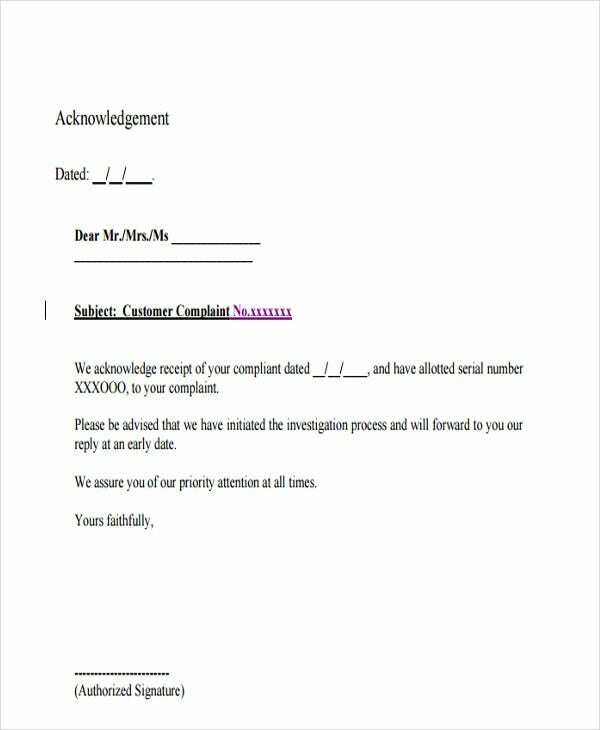 To help you out, we have collected some examples of complaint acknowledgement letters that you can use for your business. Every employer wishes that their employees remain happy and satisfied when it comes to their working conditions. But no matter how much you prepare or how good your intentions are, there will be times when employees are going to have concerns or complaints about their work. As the business owner or manager, it is your job to show that you have acknowledged these employee complaints and that you will do what you can to solve them. What can be defined as a complaint? If you put it in simple terms, a complaint or a grievance is defined as a real or imagined feeling of dissatisfaction that employees experience at various points of time while they are working for a company. These complaints must then be communicated to managers and other higher-ups within the organization so that they may be resolved. Include a complaint policy in the employee’s handbook. Once you have been able to establish a policy regarding how the company is going to handle complaints, then you should make sure that all of the information is part of the employee handbook so that employees can easily reference it. It is best that you make the employees sign acknowledgement forms to ensure they were able to read as well as understand the policy. Assign one person or department to handle all complaints that the company receives. This is often handled by those in Human Resources as they are usually in charge of dealing with other problems within the company. Discretion is important as employees want to be sure that their complaints are handled in confidence. Provide a central location where employees are able to submit their complaints. If your method for receiving complaints is through the use of a box or any other receptacle, then you have to make sure that it is in an area within the workplace that is easily accessible to all employees. Devise a way for your employees to submit their complaints in confidence. A lot of employees hesitate to share whatever is bothering them as they fear that whatever they decide to share may be met with retaliation. 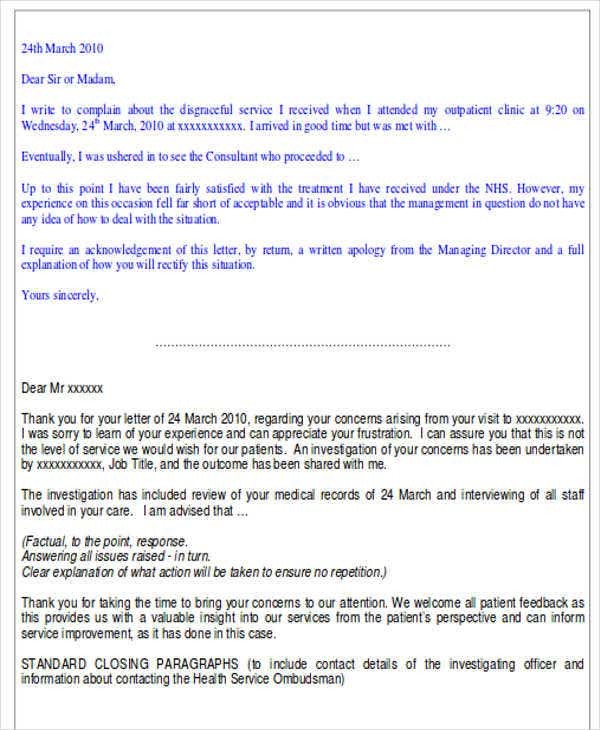 This is why encouraging employees to send their grievances through email is not recommended and can end up being problematic, as email is not a confidential means of communication. There are some cases where devising a simple online survey that does not collect identity information may be one of the best ways for you to gather employee complaints. You can also go old-school and make use of complaint forms that employees can fill out and drop in boxes. This will make them feel much more confident about sharing the concerns they have as they do not have to worry about being reprimanded for saying what is on their minds. Establish a schedule for addressing complaints and grievances. One of the most important aspects of dealing with employee complaints is addressing them efficiently and reliably. Be sure that you have set a schedule where the main focus is going to be how you are able to address all employee complaints you receive. Once that schedule is set, you have to guarantee that you stick to it. Working conditions and safety. This involves any complaint or grievance that directly addresses the employee’s work environment. This can be anything such as hazardous working conditions that managers have failed to notice. Unreasonable management policies. If employees feel that there are certain company policies that may seem a bit unfair or even unreasonable, then they are going to voice out this concern. Such policies can include those that are related to overtime regulation compliance or even the amount of workload that certain employees have within the company. Violation of rules and policies. This can be any of the rules that are established within the organization that employees believe their coworkers or even those in upper management have violated. Rules are to help maintain order and those who do not follow these rules are going to have to be reported for disciplinary action. Acknowledge. 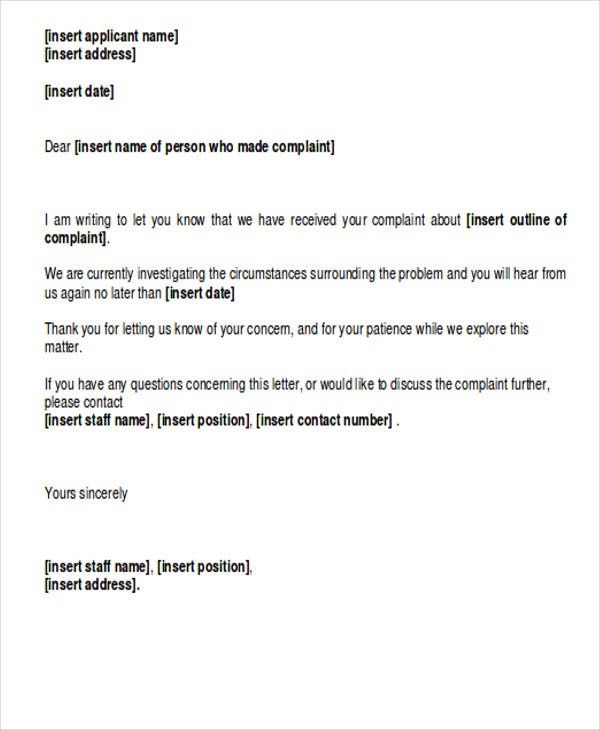 Let the employee who submitted the complaint know that you have received it and that the problem will be addressed by the company. You do not have to provide an immediate solution as just the fact that the employees know that their voices are being heard is something that they will really appreciate. Investigate. It cannot be considered a complaint if there is no evidence to back it up. You have to gather as much information as you can regarding whatever concerns an employee has submitted to you. If the employee has listed any specific incidences or situations, ask the employee about them and tell the employee to provide as many details as he or she is able to. You also have to ensure that all of the data that you have gathered is 100% accurate. Decide. After you have gathered all of the information that you need and you have fully examined the situation, then the next step is for you to formulate the best possible solution. You may want to share your idea with other higher authorities within the company or even with your employees to see whether the solution is one that will benefit everybody in the long run. Having another opinion may just be what you need to help you make this important decision. Act. After you have come up with the best possible solution, immediately act on it. Employee complaints that remain unsolved and linger around the workplace are definitely going to have a negative impact on both productivity and performance. So, the sooner that you can solve these issues, the better off your company is going to be. After you have implemented a solution, it is important to review the situation that caused the complaint in the first place once a certain period of time has passed. This way, you can take an objective perspective and make sure that the solution you implemented was able to fully solve the problem. If the employee who lodged the complaint disclosed his or her name, then it would be a good idea to check in with that employee to see if he or she is fully satisfied with the way that the complaint has been taken care of. Most important of all, do not be afraid to make any necessary adjustments that you feel will make the company even better. A legitimate complaint does not just point out any discontent in the workplace. It also helps shed some light on serious infractions or it can spot criminal activities that are going on in your office. Listening to your employees and addressing their concerns can also be great for the culture of your company. It shows that you respect your employees and that you care about their working conditions to the point where you actively listen to their problems and you do what you can to solve them. These benefits easily justify the implementation of a useful and effective system for addressing employee complaints. If you happen to receive any kind of complaint from a customer, do not look at it as something discouraging. Instead, take it as an opportunity for you to find out the problems that your company is facing which caused the complaint in the first place. So, always thank the customer for bringing the problem to your attention. Whenever a customer complains, a company can use this valuable information to improve its services or products in the near future. If companies wait too long to address customer complaints, then this usually ends up with the customers retaliating against the company. Through social media, customers have a much easier time in venting out their frustrations and they are not afraid to name the companies that provided them with unsatisfactory products or services. You need to stay on top of customer surveys and feedback so that you know exactly how the public feels about your company. You also need to keep tabs on social media. If management is not actively involved in monitoring the social media channels that the company is involved with, then you should appoint someone who can actually do it. This way, you will be able to address any issues that customers might have as soon as possible. In order for companies to be able to provide quicker responses to customer complaints, it is very important that managers give some power to certain trusted employees who can play a part in handling these issues. It is vitally important to handle an aggrieved customer with as much empathy as possible. In addition, a strong communication structure is required in order for you to stay control of the situation and ensure a successful outcome or resolution. If you can handle a customer complaint well, then you will have a lifelong customer who will remain loyal to your company. However, learning how to handle difficult complaints can be as much of a challenge as the complaint itself. So, here are a few tips that should be able to help you in handling all kinds of customer complaints. Concentrate on everything that the customer is trying to tell you. Make notes of the key facts and their concerns, so that you will have a record of the conversation that may help you out in future similar situations. Also, you should not interrupt the customer while he or she is speaking. Remember to be calm and stay in control, and always keep in mind that you are representing the company’s image while you are handling the complaint. After you have finished conversing with the customer and he or she has already said everything that he or she needs to say regarding a particular concern, you may then create an acknowledgement letter and state that you have acknowledged the problem and that you and the company are going to do what you can to address it. Then, thank the customer for bringing up the matter to your attention. Doing so will show that your company is one that cares about the experience of those who wish to do business with you. Apologize to the customer for failing to deliver the service that he or she originally expected. 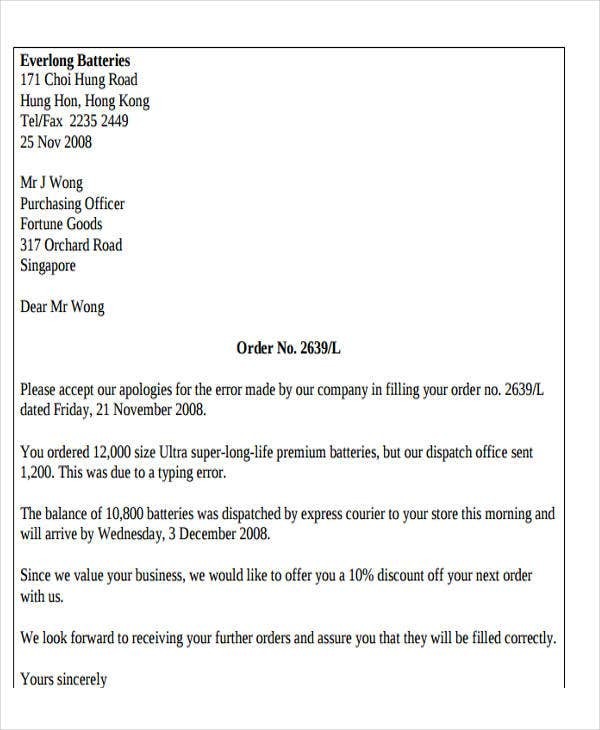 Make sure to state the apology properly when writing a letter which shows that you have acknowledged the customer’s complaint. This will show that you care about what happens to the customer as well as you wanting to make things right. You have to tell the customer that you are going to do whatever you can to make sure that you find the root of the problem. 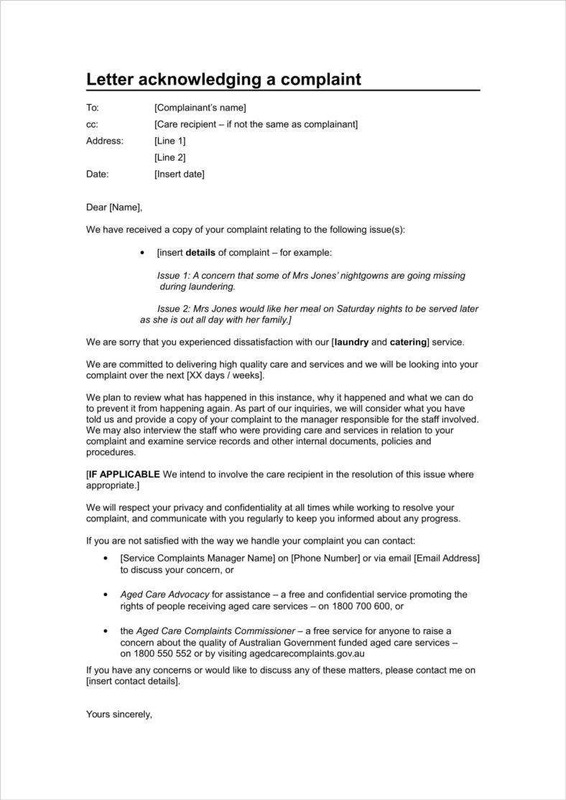 State that the complaint will definitely be looked into and that once you have gathered enough information, you will act accordingly to solve it. State in your letter how you are going to go about addressing the problem. Remember that the solution you have decided to come up with has to be realistic as well as doable. It is always better to under promise and over deliver, rather than the other way around. Take ownership of the complaint, but if you need to involve a colleague, let the customer know. 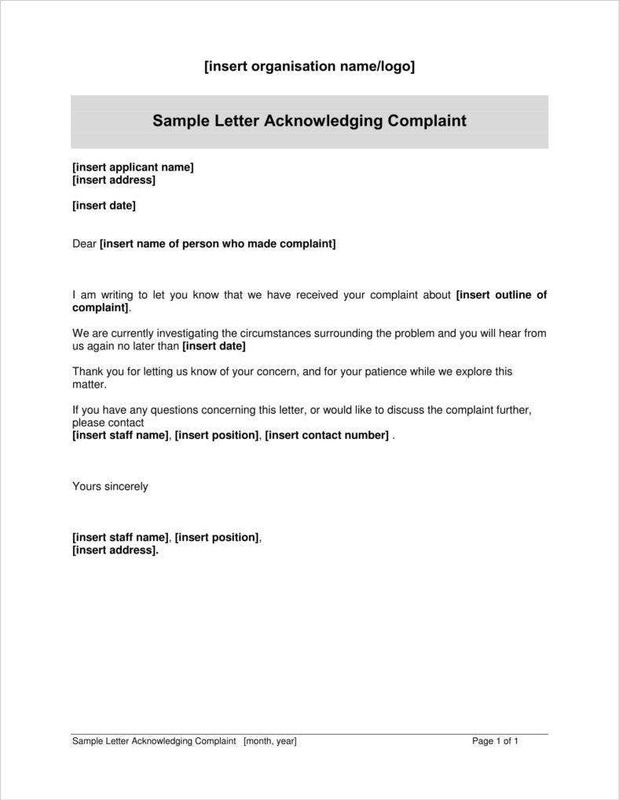 If you would like to learn more about complaint acknowledgement letters, or if you would like to learn anything related to the topic, then go through any of our other articles that may just give you the information that you need.